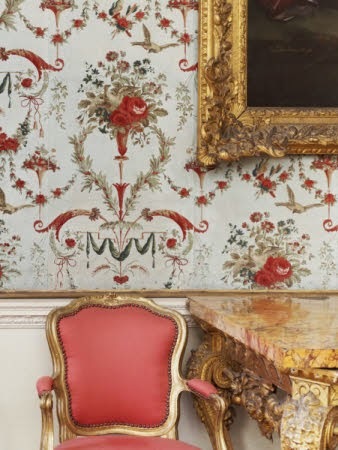 Flocked wallpaper seems an odd craze but flocks imported from England became all the rage in mid 18th-century France, prompting the well-to-do to rip down their tapestries in favour of les papiers en tontisse, les papiers veloutés, or le papier bleu d'Angleterre. "The English could never have tried to imitate our fine tapestries, so they have put them out of fashion with their wallpapers", quipped Madame de Genlis. Flocked papers were produced not by block printing but by sprinkling powdered cloth, or flock, in a pattern defined in tacky paper to resemble velvets and brocades. Production in England is usually dated from 1634, when a patent for manufacture was awarded to a London printer called Jerome Lanyer. But it did not really take off until after 1685 when John Briscoe perfected a machine for making paper which was considered as good a quality as continental papers. Shortly before 1700 Adam Price founded the "Blue Paper Warehouse" at Aldermanbury and subsequently moved into the production of flock wallpapers in blue. English designs usually imitated damask and were characteristically either in a single colour, or one colour on a gold ground. The designs would be applied either by stencilling or printing from a woodblock in adhesive onto which coloured powdered wool was spread. By this means flocked papers could be made to a very high standard, partly because of the quality of English paper, partly because of the delicacy of colouring and the superiors designs. English dominance in wallpaper manufacture in the mid-century was also fueled by what has been called "revolution in wallpaper printing"; like all great innovations, a deceptively simple idea - the wallpaper roll! The practice of pasting individual sheets of paper together - often to as long as 36 feet - before printing greatly extended design possibilities - notably the imitation of expensive textiles such as silks, velvets and tapestries. BBC Four Fabric of Britain: The Story of wallpaper : There are three separate clips: Making flock wallpaper; Painting flock wall paper and Chopping up wool. In France imported English flock papers from the Blue Paper Warehouse and other London factories enjoyed a remarkable success and were adopted by the highest society. 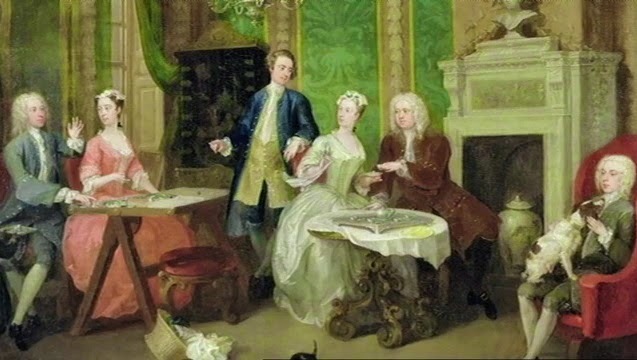 In 1753 the duc de Mirepoix, the French ambassador in London had blue papers sent to Paris and the English ambassador Lord Albermarle used them to adorn the house he had rented in Passy. According to the famous wallpaper manufacturer Jean-Baptiste Réveillon, that was the defining moment - the craze was on. In 1754 Madame de Pompadour, no less, put blue paper on the walls of her wardrobe at Versailles and on the corridor linking her appartment with the chapel; four years later she wallpapered the bathroom at the Château de Champs-sur-Marne. Though other manufacturers, such as Didier Aubert and Lecomte in Lyon, took up the production of flocks in France, it was Réveillon who was the first to master the art of the roll, matching seams and mounting the paper. He used his expertise to drive down prices whilst maintaining a quality product, and soon surpassed his English models in range and mastery. (Rosenband, p.486-7). 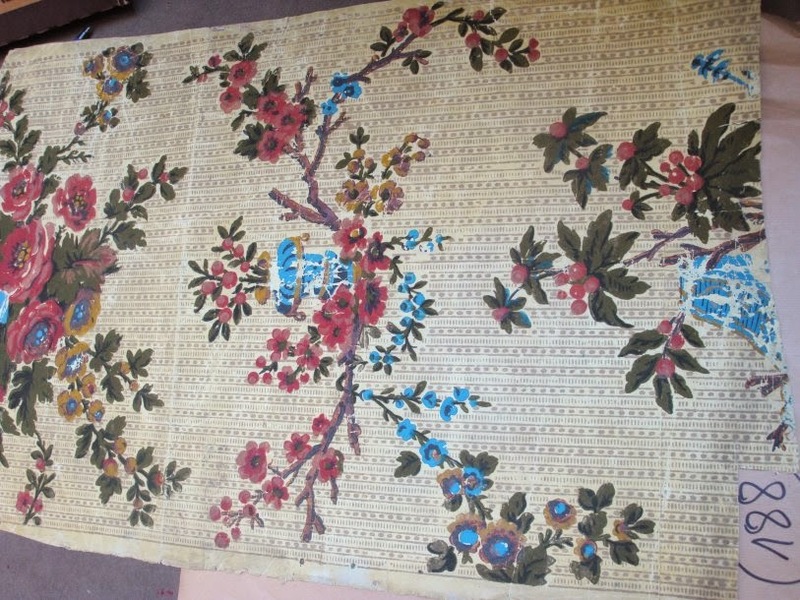 Whereas English papers were mostly monochrome with large-scale patterns, Réveillon used multi-coloured flocks to copy the intricate floral designs of Lyon silk. In these papers he made use of both superimposed layers of flock (perhaps to suggest brocade) and of repiquage or overprinting with distemper colour. Examples of Réveillon's flocked papers are now quite rare. Here is a typical sheet which was sold by Drouot in 2009 for 200€. Françoise Teynac, Pierre Nolot and Jean Denis Vivien, Wallpaper: a history (English trans. Thames & Hudson, 1982), p.66-75.